“The book provides the reader with a vast and thorough analysis of the legal language; however, we should not be discouraged by the 503 pages of the book, since the authors use plain English and clearly explain the features of the legal jargon. ... definitely the title to remember for those interested in not only learning legal English terminology but also understanding the usage of the legal terms of art in context. 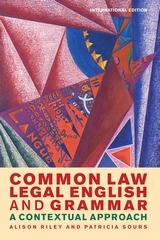 The authors teach the readers legal terminology but also equip them with legal knowledge. They use brilliant and memorable examples to illustrate the use of language, selecting them from the history of common law but also literature and news satisfying in this way the tastes of both lawyers are linguists. I will strongly recommend the book to my colleagues - legal English practitioners - as well as my most ambitious and linguistically advanced law students. Alison Riley is Lecturer in Legal English at the University of Ferrara. Patricia Sours has been a Lecturer in Legal English at the University of Padua and at the University of Ferrara.